Sean Davis is Chief Investment Officer of The Sembler Company, and has led its Investments Department since joining the company in 2007. Davis oversees all of Sembler’s financial activities, including sourcing all debt and equity, managing disposition and property acquisition activities, supervising the company’s accounting team, and advising the company’s Board of Directors on a wide variety of financial matters. In more than a decade with the company, Davis has overseen over $2 billion of capital, sale and acquisition transactions. 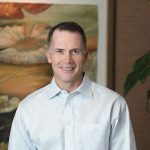 Prior to joining The Sembler Company, he spent 14 years in commercial real estate finance with SunTrust Bank and AmSouth/Regions Bank, having last served as Senior Vice President in AmSouth’s/Regions’ Commercial Real Estate Group, where he oversaw over $3 billion of construction and acquisition loan originations. Davis is a member of the International Council of Shopping Centers and the Real Estate Investment Council, and formerly served on the board of Neighborhood Lending Partners. He enjoys volunteering with Habitat for Humanity, St. Petersburg High School and the Junior Tritons basketball organization. Davis earned a Bachelor of Science degree from Louisiana State University.